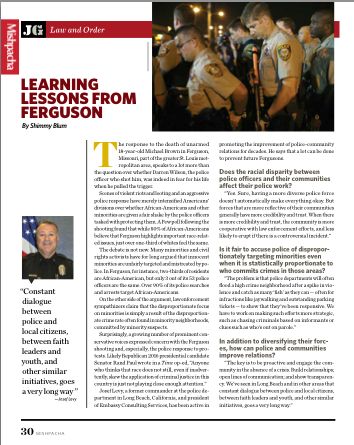 This article, "Learning Lessons from Ferguson" by Shimmy Blum, features Not In Our Town Law Enforcemen Cadre Member Josef Levy. This article is republished with permission from Mishpacha. The response to the death of unarmed 18-year-old Michael Brown in Ferguson, Missouri, part of the greater St. Louis metropolitan area, speaks to a lot more than the question over whether Darren Wilson, the police officer who shot him, was indeed in fear for his life when he pulled the trigger. Scenes of violent riots and looting and an aggressive police response have merely intensified Americans’ divisions over whether African-Americans and other minorities are given a fair shake by the police officers tasked with protecting them. A Pew poll following the shooting found that while 80% of African-Americans believe that Ferguson highlights important race-related issues, just over one-third of whites feel the same. The debate is not new. Many minorities and civil rights activists have for long argued that innocent minorities are unfairly targeted and mistreated by police. In Ferguson, for instance, two-thirds of residents are African-American, but only 3 out of its 53 police officers are the same. Over 90% of its police searches and arrests target African-Americans. On the other side of the argument, law enforcement sympathizers claim that the disproportionate focus on minorities is simply a result of the disproportionate crime rate often found in minority neighborhoods, committed by minority suspects. Josef Levy, a former commander at the police department in Long Beach, California, and president of Embassy Consulting Services, has been active in promoting the improvement of police-community relations for decades. He says that a lot can be done to prevent future Fergusons. Does the racial disparity between police officers and their communities affect their police work? Is it fair to accuse police of disproportionately targeting minorities even when it is statistically proportionate to who commits crimes in those areas? In addition to diversifying their forces, how can police and communities improve relations?